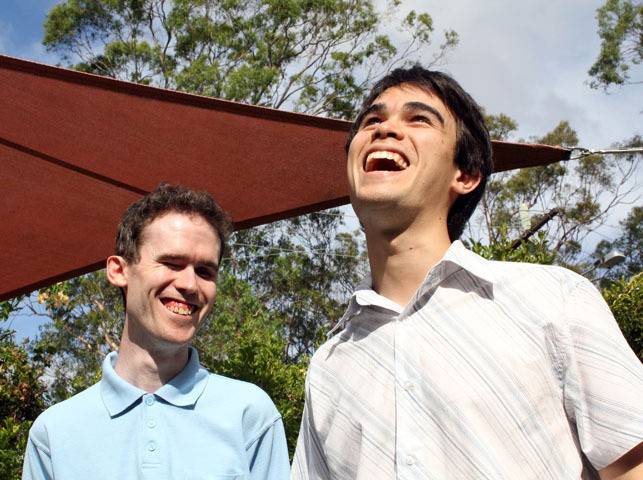 When Michael Curran and James Teh met on a music camp for blind children, little did they know they would one day join forces to improve the lives of blind and vision impaired people around the world. With a shared passion for “nerdy computer programs” the two totally blind men reunited in their early twenties when Mr Curran was fed up with the cost of screen reading software – the software necessary for a blind person to use a computer. “A screen reader allows blind and vision impaired people to get an education and to participate in the work force. These days it also helps people to stay connected through social media. Of course online banking and shopping are a huge convenience too,” Mr Curran said. Mr Curran invited his childhood friend, Mr Teh, who by that stage had become a qualified computer programmer, to help him build a free screen reader, NVDA (NonVisual Desktop Access). “I thought it sounded like a pretty interesting idea but I had no idea how far it would go,” Mr Teh said. The NVDA screen reader has gone on to be downloaded over 60,000 times, translated into more than 43 languages, used in 120 countries and has won multiple awards from around the world, including the American Foundation for the Blind Access Award 2012. “The support we get from NVDA users and blindness organisations around the world is fantastic. But we really are in need of ongoing funding to make sure we can keep the software compatible with the world’s rapidly changing technology,” Mr Curran said. The project has come this far thanks to a series of modest corporate grants and individual donations. Mr Curran and Mr Teh have just announced the launch of a revamped website at www.nvaccess.org complete with a two minute video telling their story, in a bid to attract much needed sponsorship. Companies who are in a position to sponsor NV Access can find out more at www.nvaccess.org/support A sponsorship package can include promotion on the NV Access site and social media to a dedicated international audience of thousands who are affected by blindness or vision impairment, as well as inspirational talks to your staff members by NV Access founders Mr Curran and Mr Teh.